I bet you’re all thinking about it, even if you aren’t. Why is it that most people are scared of being left in a graveyard by themselves at night when graveyards are some of the most peaceful places on the earth? I doubt it’s because of the decorum. In any shape or form, regardless of how cynical you are, all people have some kind of belief that zombies may exist at some point. 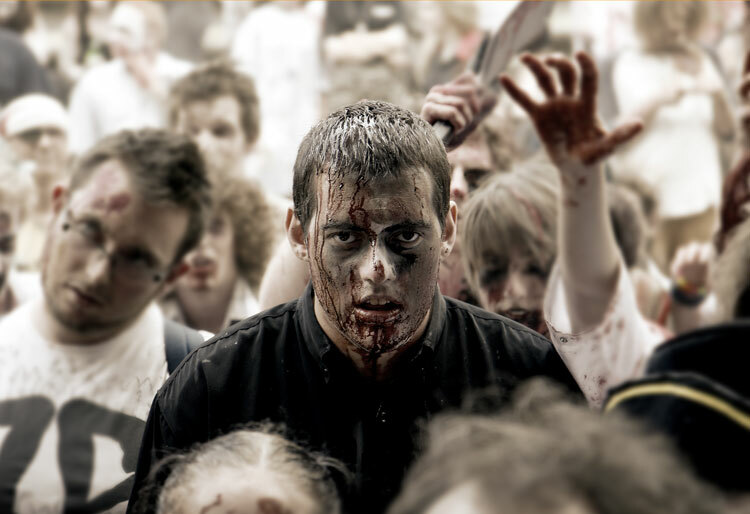 Whether it’s some sort of spooky spell that makes the dead rise from their graves or a viral infection that could turn even the most calm people to cannibalistic “walkers”, zombies are always a hot topic of conversation. But what if the horror came to life? Well before that happens and Solstice Satisfaction becomes extinct due to no electrical power, I have compiled a list of things you may need to do (or may not need to do) to survive a potential zombie apocalypse based on knowledge from watching zombie movies, reading zombie books or from playing the spectacular Multiple Choice Interactive Novel Zombiepocalypse game. Whether the zombies you have in mind are the traditional slow type that groan, or the even scarier ones that run faster than Usain Bolt, both lots are attracted to sound. If you’re smooth sailing and you see one zombie and shoot it, don’t be surprised if a whole group of them come towards you because they heard the BANG! Therefore, it’s wise to have a non-sound-making melee weapon on hand in case you need to put away a lone zombie in your area. I say a “long extended” weapon because if you have a measly knife, you’re close enough to the biter that even before you’ve thought of stabbing it, it’s already bitten you. May I suggest a baseball bat, golf club or even a parasol? Imagine that. Putting a zombie down with a pink lace parasol. I have this irrational fear that a zombiepocalypse will break out when I’m wearing jandals or ug boots or some other form of non-running footwear. Couple that with the fact that I’m as fit as a hippo and I’d be walking bait. Unfortunately, you and your impressive melee weapon techniques won’t be enough to take down a herd of zombies, so it’s best that you make a break for it and run like you’ve never ran in your life. You will be grateful that you ignored the stitches in your sides when you have successfully escaped the herd’s attention. I never understood why in Scooby Doo that the Mystery Inc gang would always split up in the most frightening situations. Sure, you’d cover more ground that way, but you are royally firetrucked if you get yourself into a pickle and there’s only one other person to save you (or no one at all). If you travel alone during a zombiepocalypse, you’re more likely to die. Soz but it’s the truth. If you travel with a partner or a group, at least you have someone to watch your back when you’re sleeping or taking a dump in the bushes. It also helps if your gang are former Marines or Doctors or something. One rule I personally don’t agree with but has proven time and time again to be successful is to stop for no one. Although this may contradict number three, stopping for no one can save your hide eventually. Taking someone else with your or adding another member to your crew just means one more person to look out for and one more mouth to feed. I can’t tell you how many “how long will you last” zombie quizzes I’ve flunked just because I’d stop to save a child. People also get really shady in tragic times like these and you never know what that crying woman on the side of the road will do to you when you’re asleep. I’m not talking permanent base like the farm on Walking Dead but I’m talking a mutual home ground for yourself or your gang to meet/rest at when needed. Permanent bases have been shown to be ineffective because people let their guard down and BAM! Herds of zombies. A commonly-but-not-commonly-used base is effective because, if by chance that you get separated from your group, you all know to meet at the base. Also, it’s nice to have somewhere familiar to sleep in terrible times like these. May I suggest a high-fenced area or the top floor of a secure building? Don’t be that douchebag that says “We don’t need more petrol, just keep going” and then the car runs out of petrol and you’re surrounded by the undead. You get even close to halfway, fill that mother trucker up. Your food source runs low, go out and find some more. Stacking up on resources isn’t greedy or anything like that. It’s wise. You never know when you may be in for a long winter. One way to learn more about something is to examine it. Why not do the same with the zombies? You may find out if they have any weaknesses, or what they react to, or how long it takes for someone to “turn”. This knowledge will come in handy in case you need to distract a zombie… or you need to know how long you have until you become inhuman. In case you are surrounded by a herd and your long extended melee weapon won’t do the trick and all your exits are blocked, then it is appropriate to pull out the big guns. Literally. Guns give you safety in distance and also pull a bigger punch than melee weapons. Of course, don’t give any firearms to any minors or otherwise woefully unequipped to use a gun because nekk minnit, accidental shootings. When the zombiepocalypse comes and you’ve survived until the end of it, be sure to write “Thank you SolSat” in big red letters with a spray can on the ground to show your gratitude for this article. Muchly appreciated.